Cooking often means the change of raw food items by the use of heat. cooking's contribution to human pleasure, culture, survival could be overstated. Now a days everyone likes to eat snacks. 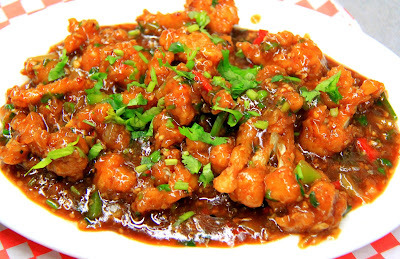 Gobi Manchurian is a snacks made with deep fried Cauliflower. 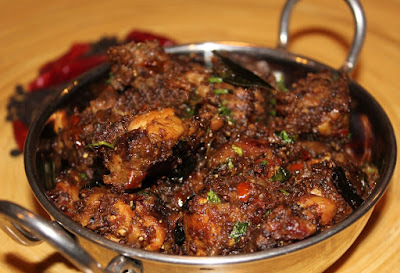 I will give you a strong and easy recipe method for cooking Gobi Manchurian at home. Note the below given ingredients and preparation procedure for the recipe and try it your self at home for your husband and children. STEP 1 - Clean Cauliflower and cut it in to pieces for fry. STEP 2 - Mix together the gram flour, corn flour, salt (as required , a few drops of soy sauce, 1 tbsp of ginger and garlic paste and water to make a batter. STEP 3 - Add some chili power in the batter ,the batter should not be more thick. STEP 4 - Dip the Cauliflower pieces in the batter mixture and rest it for 30 minutes. STEP 5 - Fry the cauliflower pieces in the oil pan, fry deeply till it became golden brown. STEP 6 - Heat up 5 tbsp of oil in the pan, add ginger garlic paste to the oil and stir well. STEP 7 - Then add green chilies, Capsicum, `Spring onion, onion and stir the mixture for few minutes. STEP 8 - Add the fried Cauliflower pieces to the gravy on the pan and mix well without breaking the pieces. STEP 9 - Add more sauces to Gobi Manchurian if required for taste. STEP 10- Garnish Gobi Manchurian with coriander leaves and Spring onion. Serve Gobi Manchurian hot as snacks for your children or else with Chapatis. For any Clarification and doubts commend below. subscribe me to get more dishes. Pepper Chicken recipe | cook Special Pepper chicken.